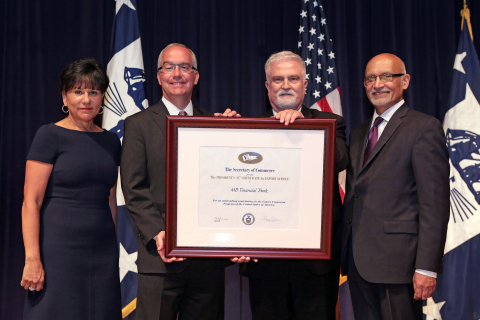 CHICAGO--(BUSINESS WIRE)--MB Financial Bank was honored today by U.S. Commerce Secretary Penny Pritzker as one of only 45 U.S. companies to receive the prestigious 2015 President’s “E” award. The President’s “E” Award is the highest recognition any U.S. entity can receive for making a significant contribution to the expansion of U.S. exports. MB received the “E” Award for Export Service in recognition of its work in facilitating export services. MB is approved under the U.S. Global Business Solutions Pilot Program. MB is recognized as a center of expertise for centralization of all of the US Government Export assistance programs. MB is Preferred Lender under SBA’s Export Express Loan Program. MB is one of less than 25 banks nationwide to be approved by the USDA to participate in its GSM-102 program. MB Financial Bank N.A. is a Chicago-based commercial bank with approximately $15 billion in assets and a more than one hundred year history of building deep and lasting relationships with middle-market companies and individuals. MB Financial Bank offers a full range of powerful financial solutions and the expertise and experience of bankers who are focused on their clients’ success. MB Financial Bank is a wholly-owned subsidiary of MB Financial, Inc. (NASDAQ: MBFI). Learn more about MB Financial Bank at www.mbfinancial.com.